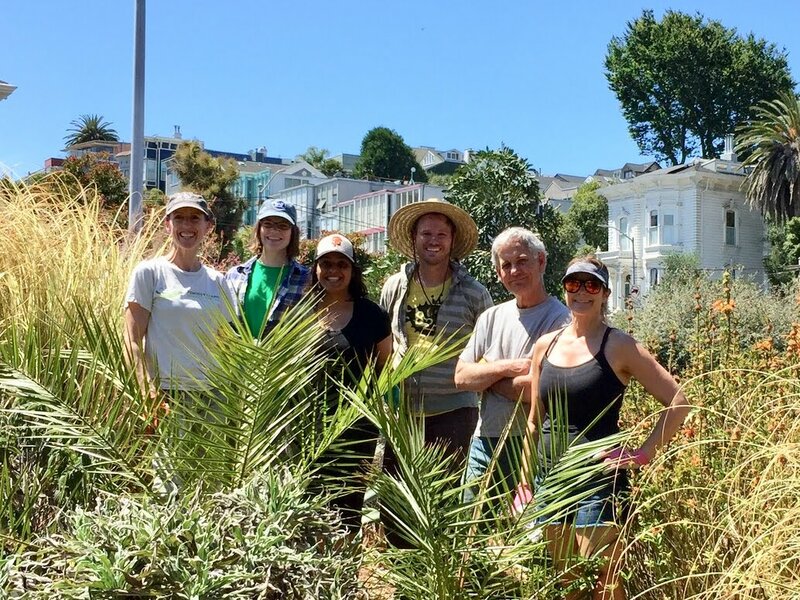 Pennsylvania Street Gardens: Another productive volunteer day! Our August workday was productive as ever. The garden is in the dog days of summer, and as dry as can be. We're taking a long hard look at plants that don't look happy now, and considering removing them so we can replace them with plants that LOVE hot, dry sites. What helped was that Matt and I were recently down at Huntington Gardens in Los Angeles, and saw how they grow their drought tolerant and xeric plants: they don't water them! All their Aloes are looking dry right now, for example - just as they would in the wild - but they'll become succulent again when we get rain, just as nature intended. But they DO water plants that were never meant to suffer through drought, wich just get weaker and weaker each year until they die. So, those are the ones we need to remove. With that in mind, our team spread out and got to work at PG and started the summer tasks of cutting back spent flowers and planting Agaves and other succulents, that can be transplanted in summer with no ill effects. First up for removal was the Fuchsia boliviana alba in the left bed. It's been limping along but had been reduced to sticks. Chris removed it and Matt replaced it with some Yucca branches which will root in place in the coming months. Matt actually took a lot of Yucca branches from the cactus wall. When rooted, they'll be planted down at PRG and help protect the fences from graffiti and other damage. Chris also cut down the cardoon (Cynara cardunculus) which we do every year (it'll pop back soon) and I removed a very leggy Phlomis fruticosa behind it, taking some good stems home to root up and make new plants. In the same area, Matt and I rearranged some Agave parryi and pulled out a lot of scraggly Aeoniums of various kinds - that's a plant that does best with a refresh every couple years: cut all the leafy heads off and re-root them, throwing away the leggy stem. Aditi and Gina have been working on a signage project, and had laminated our official No Trespassing signs from the police to post everywhere. This allows the PD to enforce asking people not to camp at PG and PRG. 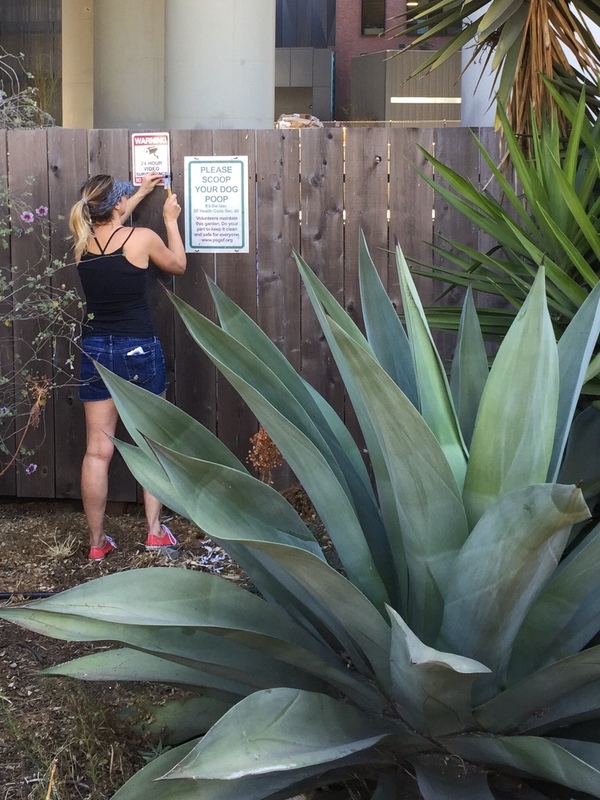 I gave them a number of metal signs asking people to pick up dogs poop too, and Gina added signs about security cameras and others asking Uber and Lyft drivers not to use the garden as a bathroom... Kunaal took the picture of Gina posting signs too. Gina cut back almost all the Salvia leucantha (Mexican Sage) and a number of Stachys byzantina (Lamb's Ears) too. 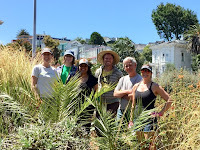 Josh and Hilary set to work planting Agave americana pups I received from Marianne in Pacifica last week. They put half a dozen along the top border after weeding the area, and then more in the Triangle Garden across the off-ramp. While at the Triangle Garden they removed a handsome pup from the big Agave "Green Giant" on the corner, and placed it in the Brights Bed. We've got lots more of those growing so they'll be spread around soon: what an epic plant!